OC Politics Blog | How did a councilman with a H.S. diploma get a County management job? How did a councilman with a H.S. diploma get a County management job? New Santa Ana Council Member Roman Reyna’s official city bio says he is now a “Case Manager,” at the County of Orange, Department of Education. Who knew you could work in the Department of Education with only a high school diploma? Sources are telling me that Reyna was allegedly fired from his last job at the YMCA. If true did he admit this to his new employer? And why was he fired? Reyna previously worked at the Santa Ana Boys and Girls Club and before that he worked in the Santa Ana Parks and Recreation Department. I am not sure how all of that qualifies him to do his current job. 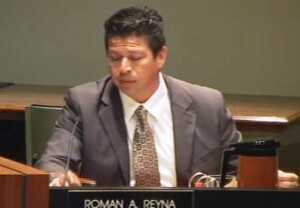 Could it be that Reyna, a former SAUSD Trustee, pulled strings with the new head of the O.C. Department of Education, Al Mijares, who of course used to the be the SAUSD Superintendent? The worst part of this is that now the Santa Ana City Council has several government workers. Mayor Pro Tem Sal Tinajero is a public school teacher in Fullerton and New Council Member Angelica Amezcua is a Santa Ana public school teacher. All of these government workers now have dual pensions and will be double dipping in their retirement, at public expense. The rest of the City Council includes a realtor, David Benavides, an engineer/consultant, Pulido, and a lawyer, Vince Sarmiento. It is by the way worth noting that the SAUSD now apparently has a $16 million dollar deficit, and the City of Santa Ana owes the State of California over $56 million dollars. Clearly Reyna lacks the golden touch! A sobering closing thought – this bunch will have to negotiate a new contract with the Santa Ana Police Officers Association later this year. How will government workers do that responsibly when they are also public employees? Please don’t disparage education, even if it’s education that lacks an accredited degree. I understand that the point you wish to make is that someone may have been given tax-funded work without having earned it or without being capable of doing the work, but to insinuate that having only a high school diploma disqualifies someone from holding a management position in a government job is misguided, if not downright insulting. I understand your point and I agree. There are probably many high school grads in Santa Ana that are better qualified to work for the County than Reyna. The story doesn’t mention a management position but instead it clearly reads that councilman Reyna uses the the title “case manager”. A case manager doesn’t imply, Reyna is in management but manages cases. However, if James knows that that Reyna’s government position is classified as management then I totally disagree it common to fill this position with someone who has a high school diploma, a questionable work history, and possible little experience managing cases. Please show me anywhere where an open management position in a government entity allows for the hiring of the applicant with the aforementioned experience and education. Of course , there is much more to learn about his selection for this position and we should request through the public information act (as what those LOC people are doing, rightly so…) and find out the exact position and it’s requirements , the pay, the applicants that applied. My guess is that Mijares had a lot of influence in this matter a long with some friendly politicos but the Board of Education should be asked to review the hiring(just like the Voice of Oc is asking about Jordan Brandman contract) and determine if it is the right decision or a political one. Well said. The LOC supports Reyna so don’t expect them to ask the right questions. I am not sure the VOC will either as they are pretty much allied with the Santa Ana Council too. Virtually every government job given to a disadvantage minority i.e. Latinos aka Mexicans and Jews is given under the Affirmative Action where any education is relevant. Like in the case of Claudia Alvarez and Jew Greg Diamond where they passed the Cal. Bar, allegedly, on lower required scores. Esq. Alvarez was hired by the OC DA without even speak coherent English. Esq. Diamond, can’t get decent employment as an attorney because he is gravely incompetent and relies on his Jewishness to intimidates Gentiles by claiming Antisemitism. I can show you hundreds of such cases and Reyna is just one of them, stupid as doorknob progressing via the Affirmative Action where only requirement is the race other than white. This position requires a college degree. So either he is lying or an exeption has been made. I am unaware of ANYBODY other than Pedroza talking about this. Certainly not the LOC and unless somethings changed not the VOC ( who remained silent on Daly until it no longer mattered). Keep Digging Pedroza. This stinks. Does Michele Martinez have a job?